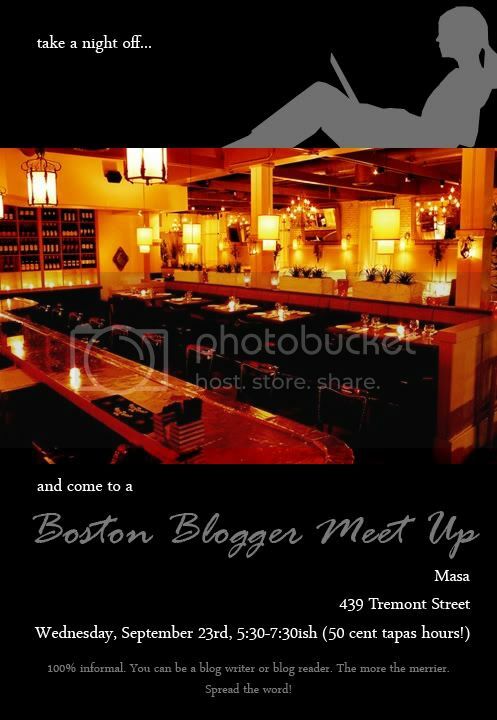 everything LEB: Boston Blogger Event! Miss Stephanie Sabbe from sabbeSPOT and I decided to put together a little Boston Blogger get together. We figured with all this emailing it was time to meet in person AND meet all the other Boston (and surrounding areas) bloggers to put faces to names. So, next Wednesday come join the fun at Masa, Stephanie and I would LOVE to see you all there!! Ohhh, sounds fun. I'll be there. p.s. why is the picture bigger on your blog? I want bigger pictures. That sounds great! My mom is the one up north, so I will make sure to tell her about it! I would love to be able to make it next week, but unfortunately I am in New Orleans! Oh 50 cent tapas! I wanna go!!!!!!!!!! Next time make the blogger get together on a weekend and I promise I will go. I can drive up and spend the weekend! But if you want to check the BF for the night that's okay with me as well. Perhaps I'll bring Jon so you can have him do things around the apt! I would love to be a part of it but just like Maureen, I'm thousand miles away. I would love to make the next one. YAY!! I want in on this one too. Definitely keep me updated and let me know if I can help with anything! Can't wait to see pics from the meet up! I wish I could go!! Oh well, maybe another time. Sounds perfect! See you all there! Excited! Count me in - love Masa! One of my fave restaurants in the city and right down the street from my old digs. Looking forward to meeting all of you! Oh no, I have a client meeting that night or I would so be there!! I'll definitely come to the next one though. Thanks so much for organizing this!